The oddball star of this engaging fantasy slowly comes to believe her unusual character and strange powers come from her distant relationship to Mother Goose. 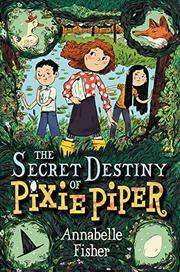 Pixie Piper knows that the other girls have multiple friends where she has only one friend, and that pal is a boy, Gray. The redheaded white girl is an avid reader and writer of poetry, yet another oddity in her town. After Pixie’s mother reveals that they are both descendants of Mother Goose (which explains her incredible facility at impromptu rhymed verse), events take off. Pixie and Gray find a large egg and incubate it to hatching. Pixie’s maternal love for the baby goose she names Destiny—a charismatic character in her own right—precipitates the arrival of Raveneece, a strange, scary female villain, into her life. Over the course of the story, Alexa and Lucy (of South African and Chinese descent, respectively, giving the story some racial diversity) become new friends and popular Sage, a sort of “frenemy.” Her small town, where everyone seems to know everyone else, is a comfortable setting. The Piper family lives in Acorn House, in a development that also houses a museum for historic toilets. Characters, even the secondary ones, are memorable and add much to the story. The climax will chill readers but satisfy them, and there is a strong hint that more books will follow—here’s hoping that’s soon.